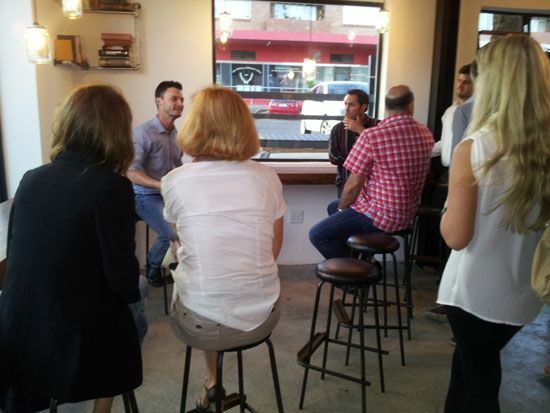 I was recently asked to talk at a Love Coffee event held at a new cafe in Linden, Johannesburg called “The Whippet.” It is a great place with a passion for quality. They are a locally inspired shop that seeks to reintroduce people to their neighbourhood and celebrate the local. I have watched the shop grow and had the opportunity to get to know the guys over the last few months, so when I was asked to speak about coffee I was thrilled. 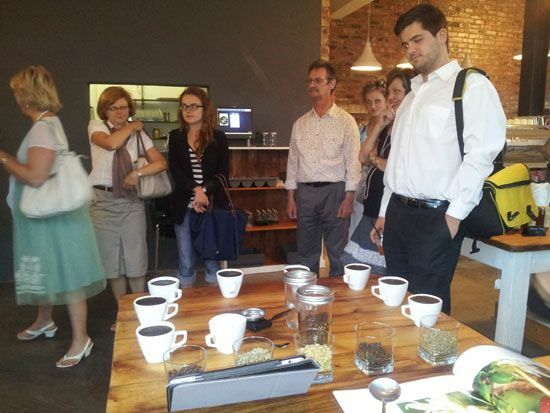 I was asked to focus my talk on the processing of coffee and the different steps required to bring us the coffee we know and love. There were three stations and each station had a different topic, station 1 was all about Linden: I live close to the area so I snuck in to listen to the first talk and was really fascinated to find out that Linden was once a peach farm! I was manning station 2. I don’t do very well in long boring lectures and don’t give them very well either, so I went for a more hands on approach. We looked at the processes behind washed and drum roasted coffee, I had samples of coffee seeds, dried coffee fruit called Cascara, coffee parchment; which is the dried and washed coffee bean before it is hulled, green coffee and then roasted coffee. 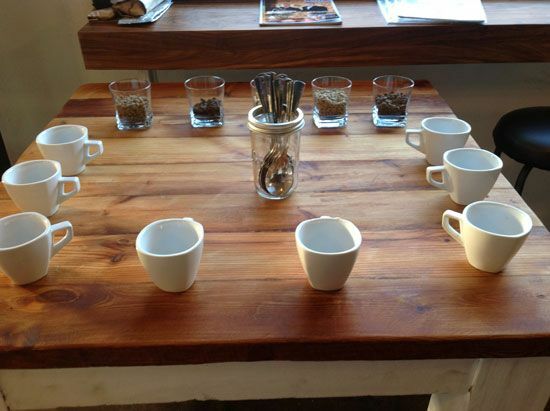 All these were laid out so that the group joining me could experience the process with all 5 of their senses. I wanted them to feel what the different stages felt like, they were asked to taste green coffee and the roasted coffee beans, they heard the coffee parchment crack as we opened it to expose the bean inside, they smelt the roasted coffee as you broke it open, and got to see what it all looked like. My goal was to take a mystical product and make it simple and real. 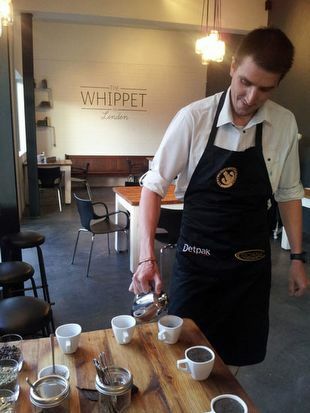 We did cupping with the Linden blend that was created for The Whippet by Doubleshot Roasters, it has Costa Rican and Malawi coffee in it. We cupped the coffee with the group and offered points to the person who could “shlurp” the loudest, we then asked everyone to tell us what flavours came to mind first, the only rule being that you weren’t allowed to say “coffee.” We had everything from rubber bands to grass, peaches to plums. We then looked at the balance and found it to be well balanced and smooth, a hint of dark chocolate bitterness and a clean finish. I asked the group to then picture how they would like to drink it and cappuccino came out top. Station 3 was all about the tea and produce, I didn’t get to listen to that talk but tasted the ice tea and it was great, it actually tasted like tea which is so rare these days. 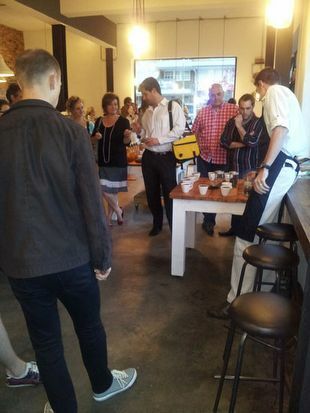 What I did notice though was only a few people from the coffee industry came to support this venture, I think as an industry this is something we can still improve on. It would be amazing if a new coffee shop was opening and we could have it jam packed with baristas and roasters to encourage the growth of coffee in SA. I am so proud of the fact that I work for TriBeCa and I love it, however I also feel a duty to the coffee industry as a whole and feel that I work for TriBeCa so that I can serve the industry. In conclusion then, let us cross the coffee lines and support each other and grow quality coffee in South Africa, let us make the enemy bad coffee rather than each other. It may be idealistic but it’s worth a try.